Bullying is personal. It’s in your face. Bullying intimidates, coerces, shames, and promotes powerlessness. Bullying has no respect for person. Socioeconomic status, race or gender does not matter. A bully uses words and physical presence to perpetuate their tortuous behavior and social media such as Facebook, Instagram, Snapchat, or Twitter to mass multiply the devastation. Bullying effects both the victim and the perpetrator. The psychological roots of bullying are based in the desire to dominate and control someone, making the perpetrator feel more powerful. Victims are at risk to become bullies to others. The Center for Disease Control (CDC) in a longitudinal, study found that there is strong evidence to support a link between violence in the home and bullying. Bullying behavior among children and adults is surrounded by a multidimensional spectrum of factors that are rooted during the first years of life. Persistent aggression at an early age increases the risk of later juvenile delinquency, adult violence, school failure, and peer problems. The interconnections between the behaviors of the victims and the behaviors of the perpetrators suggest that both of these groups are at risk for alcohol and substance abuse, poor academic achievement, depression, suicide, and antisocial behaviors. As in the recent tragic school shooting, the teen shooter has a history of depression, poor academic achievement, antisocial behavior and has experienced teasing, bullying and social ostracization. Experts and advocacy groups identify 4 types of bullying: verbal, physical, social and cyber. Usage of digital devices like cell phones, computers, and tablets. Sending, posting, or sharing negative, harmful, false, or mean content about someone else. Sharing personal or private information about someone else causing embarrassment or humiliation. Some cyberbullying crosses the line into unlawful or criminal behavior. Bullying tears at the worth and dignity of a human being and can lead to physical harm and in extreme cases can end in senseless tragedy. While all states have criminal laws that apply to bullying, not all have special statutes that apply to cyberbullying or bullying that takes place outside of school. Some states also have provisions to address bullying if it affects school performance. The 2014–2015 School Crime Supplement – PDF (National Center for Education Statistics and Bureau of Justice Statistics) indicates that, nationwide, about 21% of students ages 12-18 experienced bullying. The 2015 Youth Risk Behavior Surveillance System (Centers for Disease Control and Prevention) also indicates that an estimated 16% of high school students were bullied electronically in the 12 months prior to the survey. 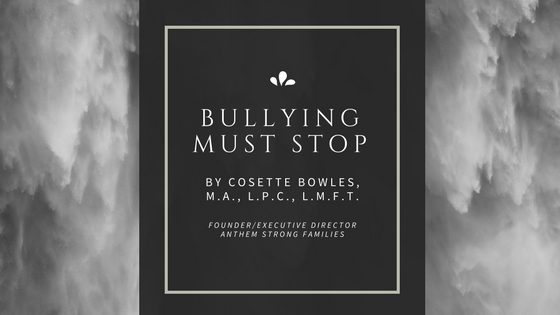 However, many of us, as adults, have been in the presence of adult “bullies” who use those same tactics to get their way in the workplace, public places and in the home. They will use repetition and escalation to intimidate others and “win” their position. Be aware that this may be “tip of the iceberg” and they have potential to be even more destructive than they are manifesting so do not underestimate them. When possible, report them so they can get the needed help. Bullying is a cowardly act. If you know of someone who has been bullied say something. Silence is not an option! If you know someone that needs help contact us at anthemstrongfamilies.org or 214.426.9000. Anthem Strong Families offers an interactive, robust mini clinic on bullying. Help us to stop this scourge! Help us to make our families and communities safer and stronger!